Who’s Fighting the Mental-Health Crisis on Campus? Unions. Grant Mao wanted to get back on track. Yale wanted to get rid of him. 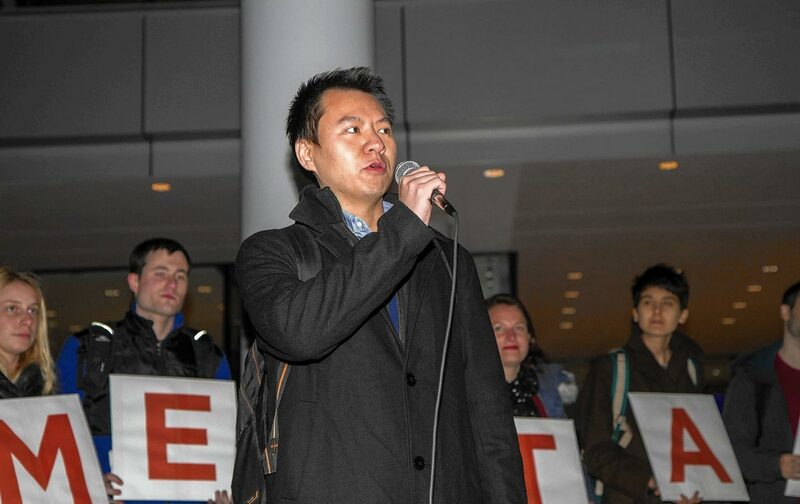 As an international student at Yale University, working toward a prestigious degree in the School of Management, Grant Mao never bothered much with the activist campaigns on campus. But last spring, he plunged into an unexpected emotional crisis, and stumbled into a longstanding labor struggle as he sought to defend his educational future. Mao, a 29 year-old native of Shanghai, saw his high hopes of a world-class education spiral into deep depression. A cascade of academic stress, a breakup with his fiancée, and his mother’s heart attack crushed him as he struggled through coursework. Mao’s mental-health crisis, which led to a six-day hospitalization, was not uncommon on Yale’s pressure-cooker campus, but resulted in unusually devastating consequences: Instead of looking toward recovery and resuming his studies last spring, he was expelled and, with his immigration status jeopardized, threatened with deportation. Now, Yale’s Graduate Employee Student Organization (GESO), the UNITE HERE!–affiliated labor group that Yale graduate employees have been trying to turn into an official union for over a decade, has rallied behind Mao and turned his personal crisis into a cause for the whole campus community. His plight and GESO’s labor battle share a political goal: making Yale a fairer, healthier, and more inclusive academic community for students and workers. Though Yale’s Mental Health Services system is supposed to provide general psychiatric care for all students and employees, GESO argues that services on campus are deeply inadequate and fraught with bureaucratic barriers. Mao did manage to receive therapy while enrolled, but the academic consequences he suffered, he argues, resulted from incompetence and discrimination. After struggling through his coursework without realizing his worsening condition, Mao eventually received a professional diagnosis in May—a depressive disorder that likely affected his academic performance. He consulted with the administration in hopes they would make an exception based on his medical circumstances. But he claims Yale unsympathetically insisted that he had not proven his circumstances warranted special accommodation for his poor grades. He was dismissed, and his appeal for leniency was rejected by a faculty review board. “They simply just wanted to get rid of me,” he says. In Mao’s view, the administration’s decision was colored by “discrimination against my national origin as well as discrimination against my mental illness.” Cultural incompetence and stereotypes based on his Chinese background, he argues, primed administrators to overlook and ignore his situation. Mao says he has managed to retain his legal status by stringing together temporary-study programs. He is currently enrolled at the University of New Haven, continuing to receive mental-health treatment at a different provider after being severed from Yale’s healthcare system. When he partnered with GESO to campaign to stay at Yale, he discovered he was hardly alone in his struggle with mental illness. A petition to reinstate him has garnered some 1,000 signatures, and his story has galvanized a campus-wide call for comprehensive, culturally competent mental-health care. GESO activists say Mao’s story speaks to a silent scourge that has festered in Yale’s hyper-competitive environment. Though comprehensive statistics on mental illness in graduate school settings is lacking, depression and anxiety are seen as a routine, culturally ingrained experience in campus culture. A landmark study of graduate students at University of California, Berkeley, found that “nearly half of graduate students reported having an ‘emotional or stress-related problem’ within the previous year,” and just one in three received services. Across campus, Mao’s story has been echoed by other students who have suffered mental-health issues that they say are aggravated by the academic pressure and economic hardships weighing on graduate students. Geology and geophysics student Jennifer Axler testified about the difficulty of dealing with chronic anxiety while attending Yale, including having to wait up to two months to be placed with a therapist. “I shouldn’t have to wait till my mental health deteriorates into an emergency to receive treatment,” she stated. GESO cites several barriers to mental-health care, including excessive wait times, sometimes as high as several months for an initial appointment with a therapist, an overall lack of diversity in services, and what GESO describes as an informal “session cap” in which students are reportedly “told that they will have to end their treatment after a set number of sessions,” which can disrupt treatment. As GESO campaigns for full recognition of the union—joining several other campaigns for graduate student unionization on private campuses—the organization has urged Yale to institute a publicly transparent process for reforming mental-health services.